We’re more than halfway through our series about life as a work in progress! Thanks so much for hanging in with me this week. If you’re new here, welcome! I’m enjoying the new faces and feedback and appreciate your taking the time to come visit my little blog! If you’d like to check out the series from the beginning, feel free to check out the sidebar to find the posts in order (or see the links below). 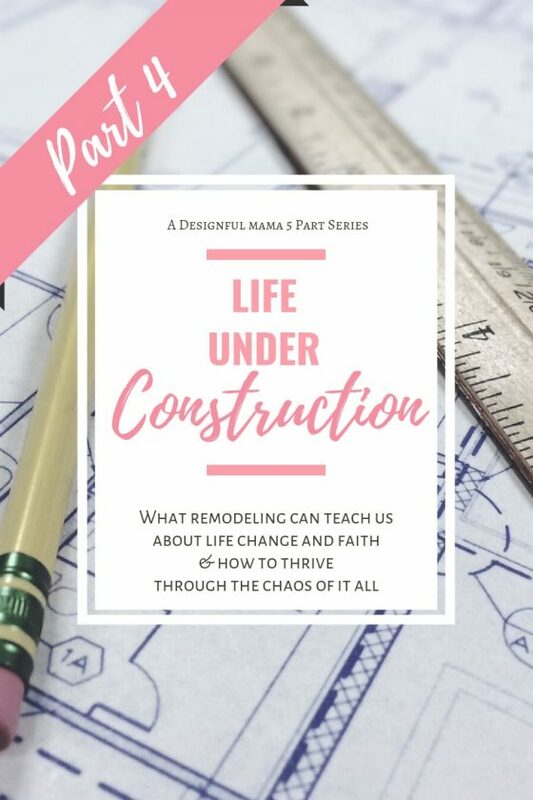 This week we’ve been looking at life change and transformation from a designer’s perspective, and how similar it is to the home remodeling process. We’ve looked at planning, promises and preparation (aka the hot mess phase), but the progress phase is when it finally starts to look like something is happening. It’s exciting to begin the construction process and natural to want to plow ahead and get to the part where things are beautiful again. But so often once the layers of old stuff begin to come away, we find a problem that needs to be dealt with. Sometimes, it’s an underlying issue we kind of knew about, but hoped really wasn’t that bad. Once it gets exposed, though, it’s evident we can’t just cover it back up. It needs to be addressed so it won’t cause problems down the road. Imagine you install new flooring over dry rot. Two things can become problematic: 1) the existing dry rot may cause weakness in the floor that will be more costly to repair later, and 2) the dry rot problem is going grow and get worse if the cause of the dry rot is not identified and corrected. When problems creep in like a fungus they have a bad habit of not going away on their own. We have to deal with them intentionally if we are going to move on! From time to time a problem may arise that is severe enough that the area has to be gutted, cleaned out, repaired and rebuilt. Sometimes what needs to be gutted are poor decisions or behaviors that aren’t in line with God’s plan for our lives. In our faith, that means surrendering the parts of ourselves that are keeping us from growing, and allowing God to prune them away. Like a healthy vine, our lives must be pruned so we can grow optimally and produce the best fruit. Whether that pruning needs to be physical or spiritual, parting with the old to make room for the new can be painful, but is both freeing and necessary. After the demo, repairs and reframing are complete, we finally get to see the project take shape. The project starts looking less and less like a construction zone and more like a new room. It’s exciting to watch it come together! As new fixtures and surfaces get added, an interesting phenomenon happens: we begin to notice how old, outdated and shabby other things in the area look by contrast. In our own lives it often works the same way, especially in the areas of health and spiritual growth. As we adopt healthy changes in one area, we begin to more easily identify (and desire to change) other areas in our lives that could be healthier. And as we begin to draw closer to God and grow in our faith, He shows us areas where we need to be more disciplined. 3. Good work takes time. At the beginning of the project there is a certain level of excitement that comes from seeing changes on a daily basis. But after a while, progress slows down. Sometimes the changes are happening so slowly, we don’t see any noticeable change when we see it every day. We get frustrated and feel like nothing is happening. Part of my work as a desiger involves visiting the jobsite to check in with the client and see how things are coming along. It’s always a delight to walk in and see how much progress has taken place since my last visit. But from the client’s perspective it looks about the same today as it did yesterday. When we live through a transformation, it’s hard for us to notice the progress. It isn’t until we see it from another perspective that we recognize how far we have come. This where our community comes in. Our dearest, trusted ones who see the changes we are making, and even when we don’t see them in ourselves, they can help point out our progress and encourage us to keep pressing forward when it feels like our efforts are not producing results. Many clients also choose to keep a photo journal of their project. This allows them to remember what things looked life before, and gives them a time-lapse visual of the progress that has happened. We can see our own personal progress in much the same way. We can journal our thoughts and fears, record our prayers, and keep a gratitude log, so that we can look back and see how our prayers were answered, how our attitudes and faith has changed over the course of our experiences, and how God can use our progress for His glory. Dear friends, we were created for a purpose! And it is when we open up our hearts and lives to embrace the mess of it all that we can allow our experiences, our trials, our heartaches, our life lessons and our stories to be used for that purpose. Join me tomorrow for the conclusion of the series, when we’ll talk about the BIG reveal!